The Ultraviolet-installation at Lovo waterworks and effects in the distribution net. Stockholm Water Co. owns two waterworks, Lovo and Norsborg, and supplies water to about one million people in the Stockholm area. Lovo waterworks, which has earlier used conventional chloramination (consecutive addition of ammonium sulphate and sodium hypochlorite), has recently converted one of the two production lines to Ultraviolet-disinfection and addition of preformed monochloramine. One of the reasons for converting to Ultraviolet and preformed monochloramine was to achieve a more efficient disinfection. Another important reason was that chlorination of the water, which has a rather high content of humic substances, resulted in both formation of chlorinated by-products and formation of biodegradible organics (AOC). The Ultraviolet-installation consists of two Wedeco low-pressure K-type units, each with a capacity of 3000 m3/h. Each unit has 108 lamps. Despite the great number of lamps we found the low pressure technique more economic due to its lower energy consumption. A rather ambitious sampling and analyses programme was set up in order to study the effects of the new disinfection strategy before deciding to extend it to the other production line and to the other waterworks. 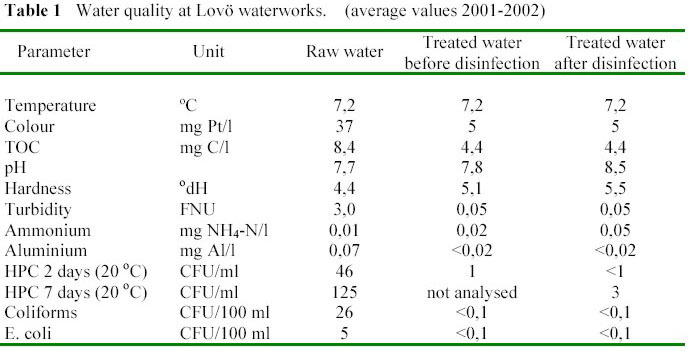 We have had good opportunities to study the effects of the change in disinfection strategy since only one of the two production lines at Lovo waterworks were converted and the other continues with conventional chloramination. The two lines does also deliver water to different parts of the distribution net. The bacterial tests were mostly focused on heterotrophic plate count (HPC). The reduction of HPC over the Ultraviolet-units was about 3 log-units. The HPC-numbers increases however rapidly in the pipes and tank immediately after the Ultraviolet. The tests show that the combination of Ultraviolet and preformed chloramine does not form any measurable amounts of THM. In Sweden, the surface water treatment plants constitute only about 10 % of the total number of waterworks but they serve approximately about 50 % of the population. Chlorine is the most commonly used disinfectant for drinking water and chloramination is the most frequent method used in Sweden. Groundwater is normally distributed untreated or sometimes disinfected by Ultraviolet. There are around one thousand Ultraviolet-installations running in Sweden, both at waterworks and in the distribution systems. The major part of these installations are low pressure lamps treating groundwater. In recent years, greater focus has been put on alternatives to chlorine which has favoured Ultraviolet disinfection also for larger waterworks and other waterworks treating surface water. Stockholm Water Company supply drinking water to about one million people in Stockholm and nine other municipalities around the city. The drinking water is treated in two large waterworks, Lovo and Norsborg, and the total water production is about 130 million m3/year. screens, chemical precipitation (aluminium sulphate), sedimentation, rapid sand filtration, slow sand filtration, pH-adjustment and disinfection with chlorine (Lovo WTP is using sodium hypochlorite) and ammonium sulphate to get chloramine for the distribution net. Lovo WTP has used cloramination as disinfection method since 1943. At the beginning ammonia gas and chlorine gas was used, this was later changed to ammonium sulphate and sodium hypochlorite. The chlorine dose is normally 0,5 mg/l. During the winter when the water temperature is below 5 0C the chlorine dose is lowered to 0,4 mg/l. After the final pH-adjustment, ammonium sulphate is added to the water and then is hypochlorite added. This is performed just before the water enters the chlorine contact tank/reservoir with a residence time of 45 – 60 minutes. The addition of ammonium sulphate is adjusted to get an internal chlorine consumption of 0,2 mg/l and a residual chlorine content consisting of chloramine when the water is pumped out to the distribution net of 0,3 mg/l (0,2 during winter). The presence of free chlorine resulting in internal chlorine consumption is important for getting a sufficient disinfection effect but it also results in the formation of chlorination byproducts like AOX and THM since our water has a relatively high content of organic material (humic acids). Due to the use of chloramination the content of by-products can be kept low. For example the THM-content is normally about 4 µg/l when using conventional chloramination. Even though the levels of disinfection by-products are low, the use of chlorination and the presence of THM and other by-products is questioned, and the debate will probably not decrease. Besides the health aspect and the consumers trust, the use of chlorine has also an environmental aspect, for example a large part of the AOX-content of the sewage sludge comes from the drinking water chlorination. Another drawback of the presence of free chlorine at the disinfection is the formation of biodegradable organic substances (BDOC or AOC). These problems with chlorination and also a desire for a more efficient and safer disinfection made us interested in Ultraviolet-disinfection and especially the combination of Ultraviolet and preformed chloramine. equipment in 1998 – 1999. During the same time preformed chloramine was manufactured and tested in the laboratory. • The Ultraviolet-dose (fluence) 200 J/m2 was sufficient for our demands and gave considerably better disinfection results than our normal chloramination. 200 J/m2 gave about 2,5 log reduction of heterotrophic bacteria, compared to about 1 log for chloramination. • We had virtually no scaling problems and the fouling of the quartz sleeves was negligible even after one year of operation. • Our low water temperature during winter (down to 1,5 0C) created problems for some of the equipment. • Ultraviolet-disinfection or Ultraviolet and preformed chloramine did not produce any measurable amounts of biodegradable carbon measured as AOC whilst the AOC content increased by almost 100% at normal cloramination. • Preformed chloramine had little direct disinfection effect but prevented regrowth of bacteria in Ultraviolet-disinfected water. • Preformed chloramine did not form any measurable amounts of THM at the doses tested. After the positive results from the pilot tests, we took the decision to commence with a fullscale installation at the Lovo plant. The Ultraviolet equipment have been installed in one of Lovo waterworks two production lines and a careful evaluation of the installation should be performed before any decision should be taken for installation at the other line and at the other waterworks at Norsborg. Each criteria was given a score (1-5) based on certain specified aspects, the technical scores was weighted 8 % each when the final mean score was calculated together with the LCC score, which was weighted to 60 %. Stockholm Water Co. invited seven vendors to propose on supply of Ultraviolet equipment to Lovo waterworks. Proposals were received from three of them. All three vendors fulfilled the requirements set out in the tender documents. When the scores was calculated according to the method set out in the tender, a low pressure system from Wedeco got the highest final mean score, and was selected for Lovo Waterworks. The low energy consumption was an important factor to give this system a high LCC score. For disinfection of high flow rates of drinking water, Wedeco has developed the K-type Ultraviolet disinfection series. These units are multiple lamp, in-line reactors with lamps arranged crosswise to flow direction. 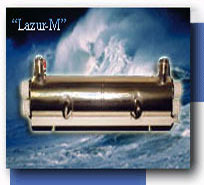 The specific system for Lovo waterworks is called K 4500. Some technical data is presented in Table 2. A similar K-type system is also recently installed at Gorvaln waterworks north of Stockholm, which also uses surface water from lake Malaren. Since we have a high bacteriological quality of the water entering the Ultraviolet-units and a rather safe raw water supply we decided to use the Ultraviolet-dose (fluence) 200 J/m2. We were also concerned about affecting the humic substances in the water in a negative way if using a higher dose. The two Ultraviolet units at Lovo was installed in an existing space between the incoming pipes from the slow sand filters and the original chlorine contact tank/reservoir. The space for installation was limited, so each Ultraviolet unit had to be built in four sections with flange connections. The Ultraviolet-units was started in October 2001 but conventional chloramination was used together with Ultraviolet until September 2002. Preformed chloramine is produced by reacting sodium hypochlorite and ammonium sulphate. The pH and the concentration of the solution is important both for getting monochlormine (which is the preferred product) and for the stability of the chloramine solution. Our production facility is built for batch production of chloramine and is designed for full production at both production lines of the waterworks. The same hypochlorite and ammonium solutions is used as for conventional chloramination. Sodium hydroxide is used for the pH adjustment. The produced chloramine solution contains about 1 g Cl2/l and has a pH-value between 9 and 10. The dose of chloramine to the drinking water is 0,2 – 0,3 g Cl2/m3 to keep the chlorine residual at about the same level as it was with the conventional chloramination. 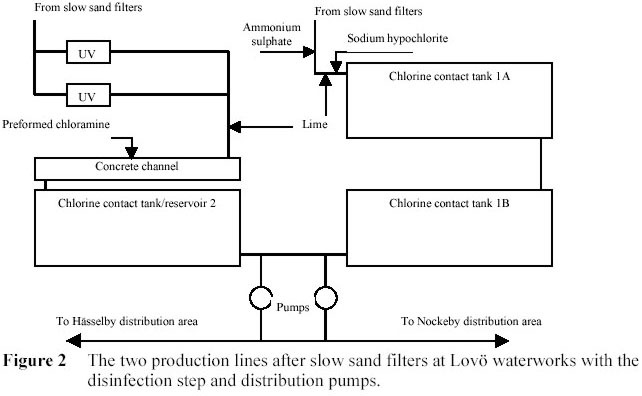 After the slow sand filters the Lovo waterworks is divided into two separate production lines for disinfection and pH-adjustment. Each of the production lines have a production capacity of 6000 m3/h and a normal production of about 3000 m3/h. One of the lines is converted to Ultraviolet and preformed chloramine and the other continues with conventional chloramination. The production lines does to a large extent deliver water to different parts of the distribution network. This gave us a good opportunity to compare the two disinfection methods. 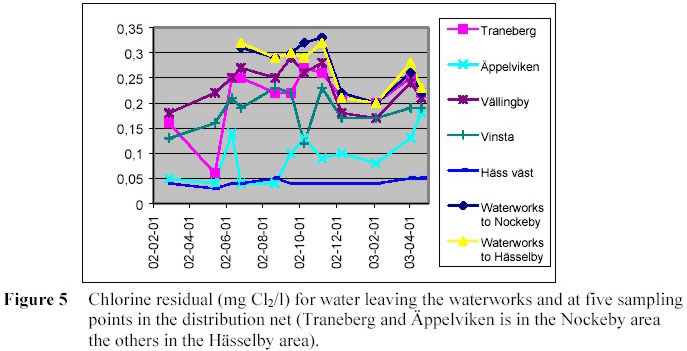 The area receiving mainly Ultraviolet-disinfected water is referred to as “Hasselby area” and the reference area receiving conventionally chloraminated water “Nockeby area”. There is usually a certain degree of mixing of water between the two areas depending on which pumps that are used. It is usually well below 20% of the delivered water to each area that comes from the other production line. Besides the normal control programme for sampling and analyses in the network, four sampling points have been used in the respective area. This points represents different distances from the waterworks (or different age of water). Samples have also been taken where the water leaves the waterworks to the two areas. As a part in the evaluation of the disinfection method the formation and growth of biofilm in the network is specially studied by a Ph.D. student at the Swedish Institute for Infectious Disease Control. Within this project the bacterial species in the water and biofilm will be identified. The heterotrophic plate count (HPC) 2-day analysis was modified to obtain a higher sensitivity. Water samples (10 – 1000 ml) were filtered with black 0.45 µm filters (Sartorius Cellulose Nitrate filter) and the filters were placed on petri plates with R2A agar. The plates were incubated for two days at 20 0C. For the 7-day HPC analyse 1 – 5 ml of sample was mixed with R2A agar and incubated for seven days at 20 0C. At the regular analyses in the network Stockholm Water Co. uses 7-day HPC according to Swedish standard SS028169-2, which incorporates yeast peptone agar, 1 ml of sample and 20 0C incubation. The AOC analyse was performed by the Swedish Institute for Infectious Disease Control (SMI) accordning to the method MB040B00.V03, which is a slight modification of the AOC procedure that initially was developed by Van der Kooij. Pseudomonas fluorescens strain P17 was used in these measurements. THM were analysed by the Swedish accredited laboratory Sweco Ecoanalys. THM (sum of chloroform, dichlorobromomethane, chloro-dibromomethane and bromoform) were analysed according to the standard EPA 524.2. All samples were delivered to the laboratory the same day as they were taken. We are still in a quite early stage in the evaluation process and therefore are the results and conclusions following often preliminary. At the acceptance tests of the Ultraviolet system in October 2001 the installation passed the tests in most respects but failed in the most important, the bacterial inactivation. Since the installation incorporated 900 bends in the pipes just in front of the reactors, the flow pattern was suspected as being the cause of the unexpected low bacterial reduction. After installation of baffle plates in the inlets to the reactors a new series of inactivation test was performed and this time the installation passed the test. The log reduction was between 2,6 and 3,1.
large and has to be further investigated. The combination of Ultraviolet and preformed chloramine have now been in use in the Hasselby production line for seven months (02-09-10 to 03-05-10). During that period about 35 samples taken in the Hasselby area have been analysed for 7-day HPC during the normal control programme for water quality. This values have been compared with analyses from the same area and seven month period during earlier years (Figure 3). In the period 01/02 Ultraviolet was used in combination with conventional chloramination. The HPC-numbers have decreased since the installation of Ultraviolet but it is to early to draw any conclusions from this limited data. Besides the normal control programme, eight sampling points have been selected (four in each distribution area) and are specially studied. 7-day HPC on R2A agar is among the analyses made on these samples. The results from five of the points in the network and the two points at the waterworks is shown in figure 4. So far, there is nothing indicating any obvious differences between the two areas regarding the development of the bacterial quality in the two areas. Before the change of disinfection method, there was some worry that the chlorine residual should decrease faster when using preformed chloramine since the humic acids had not been oxidised or chlorinated as in the case with conventional chloramination. The data collected so far does not support this theory. The chlorine residual appears to be equally stable as with conventional chloramination (Figure 5). 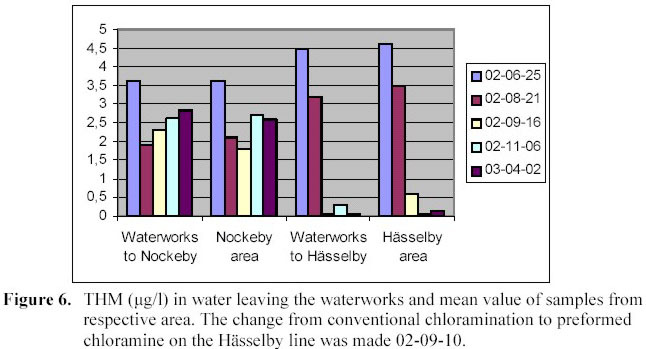 The results shows that the formation of THM when using Ultraviolet and preformed chloramine is negligible (Figure 6). The small amounts measured is probably due to a small intermixing of water between the production lines. It has earlier been shown that our conventional chloramination generates AOC due to oxidation of humic substances and that this is not the case when using preformed chloramine. This was also shown in our pilot scale tests. The data from the full scale seems to support this for the water leaving the waterworks. There is however no significant difference between the two distribution areas (figure 7). We have, as shown above, fulfilled the first two expectations. Regarding the third we can, by using Ultraviolet and preformed chloramine, achieve lower AOC levels at the waterworks but if the conclusions from the limited data above is correct, there is no difference in AOC further out in the distribution net. This difference on AOC at the waterworks and in the distribution net could perhaps be explained by assimilation of AOC by the micro-organisms in the water and biofilm to a kind of balanced steady-state level of AOC. The risk for regrowth of bacteria, in the parts of the network were the chlorine residual is low, is probably equally large for both disinfection methods. The risk for bacterial growth containing pathogenes is however probably smaller if using Ultraviolet and preformed chloramine due to a more efficient disinfection and then a more effective barrier to protect the network from intrusion of pathogenes.